Robert Amacker has spent over half a century in pursuit of the deepest secrets of T’ai Chi Ch’uan. Robert was born in Texas in 1944. He began practicing martial arts with self-study of Judo at the age of eleven. For ten years, he studied Karate and Aikido with some of its foremost exponents (Bobby Lowe, Peter Urban, Yoshimitsu Yamada). Robert studied Zen meditation with Roshi Hakuun Yasutani and Katsuki Sekida. At the age of twenty-one, he took up the study of T’ai Chi Ch’uan in New York City with Cheng, Man-ch’ing, a student of Yang, Cheng-fu, and later with two of his students, William Chen and Ben Lo. Chu, Ch’u-fang and Robert Amacker, 1972. From 1969 to 1974 Robert Amacker studied with Chu, Ch’u-fang, another student of Yang, Cheng-fu, from whom he learned the advanced techniques of the Yang family (Three-step, Ta Lu, Sanshou). For a year as an addition to learning T’ai Chi Ch’uan Robert studied Monkey Style Boxing with Quan, Sai-hung. 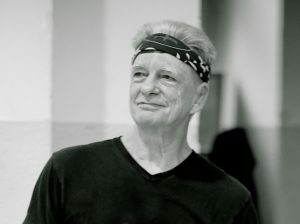 Robert Amacker has taught T’ai Chi Ch’uan since the spring of 1968, without a single break, and with over two decades in both the San Francisco Bay Area, and in Moscow, Russia. What he teaches is the most historically classical style of the Yang Family, the result of lifelong research on his part and this authenticity has been verified numerous times by teachers on the Chinese mainland. Robert Amacker is co-author of today’s most widely acclaimed and utilized translation of the Classicsof T’ai Chi Ch’uan. He is the author of a widely acclaimed book, The Theoretical Basis of T’ai Chi Ch’uan.